Two years ago, shopping at the Harrogate Knitting and Stitching Show, I chanced on the Oakshott shot cottons stand. I was looking for fabrics to make a family tree quilt for my Mum and fell in love with their beautiful shot cottons. I picked up an F8th pack of Liparis which are 16 colours each shot with black. The shooting with black (is shooting the right verb for shot cottons?) produces 16 beautiful deep rich jewel colours. And later on in the year, I made my parents a Xmas pillow with the leftovers instead of sending a Christmas card. My sisters and I have an informal competition each year to see who can send my parents the best Christmas card and it seems only right that I up the ante each year to keep them on their toes. Watch out Julia and Tania, there's more where's last year's "card" came from. Plenty more. What beautiful projects! Very inspirational, thank you. 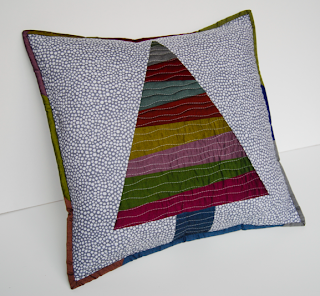 Beautiful quilt and tree cushion with a lovely mix of colours and sweet little borders round the cushion and quilt. I saw the Oakshott stand at Birmingham this year, but was completely unable to choose a set of colours (apart from "can I have them all, please?"). 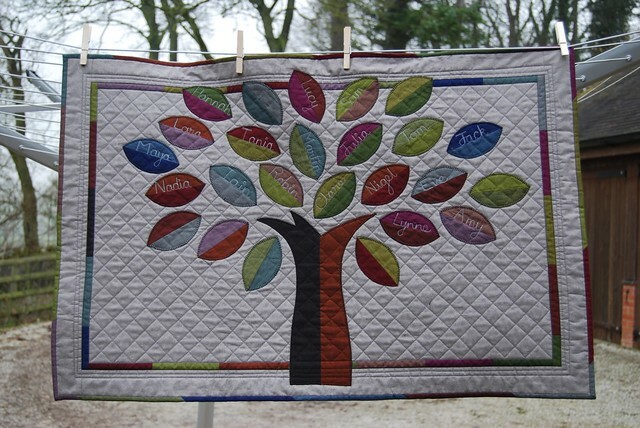 The family tree quilt is so lovely ~ the shot cottons really make it look amazing. Love the competition ~ I'd love to know what your sisters make too! Ohhh, how pretty that pillow is! Love those ideas, too! Hahaha! Can't wait to see what kind of card they get this year. The family tree is pretty great. Lovely projects Lynne and the colours of the Lipari are fabulous! I am sure your parents appreciate all the cards they get and my what a competitive family ....still!? I need some! Well, I'll settle for an alternative Christmas card! Ever tried putting a Christmas cushion on the mantelpiece? These fabrics remind me of the beautiful Cherrywood solids that have a sueded look to them. I especially like your Christmas Tree pillow, which looks great as is, but I can't help imaging how some beaded embellishments would enhance its beauty. Surprisingly to me, I'm not the embellishment type. Your competition reminds me of when I was a child, my five siblings and I would judge the Christmas cards we received each year and award superlatives such as first to arrive, best sentiment, funniest, most religious, prettiest, best Santa, best Angel, best Snowman, etc. That obviously was back in the day when everyone sent holiday greeting cards and we didn't have all of the electronic gizmos to occupy our time. Most years we would receive well over 100 cards. Ooo think I may have to give Oakshott a try at some point now. Wow. I love the colors of the fabrics in that pillow.